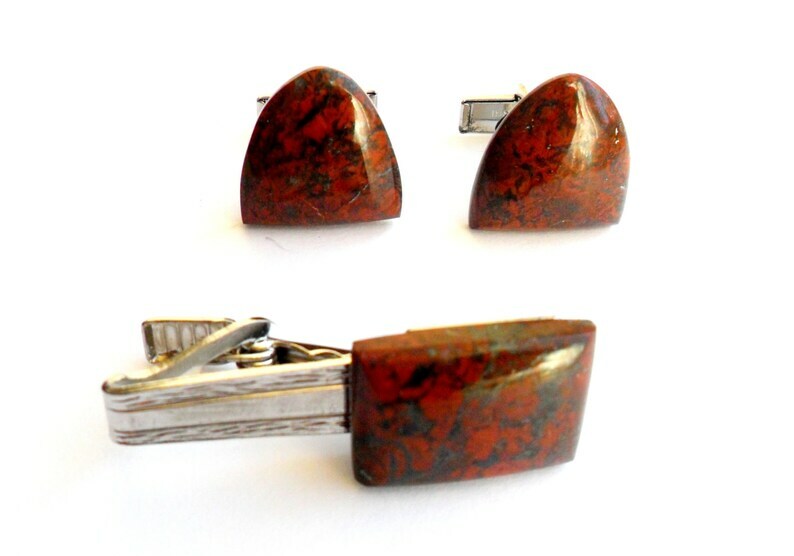 Wonderfully unique set of brecciated red jasper cufflinks and tie bar. This set is in great condition. Polished red and black marbled cabochons are attached to silver tone metal findings. They would make a great gift for a groom or father of the bride. The cufflinks have a patent number, but the set is unmarked, otherwise. Cufflinks measure 3/4 inch wide. Stone on tie clip measures 7/8 inch wide, 5/8 inch tall. Tie clip measures 1 3/4 inches long.